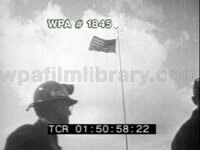 U.S. Coal Strike (Head clog renders the first few seconds of footage virtually useless.) MS United Mine Workers of America President JOHN L. LEWIS posing for photographs on patio, walking down steps toward car. TLS Municipal Court building, American flag hanging from front; MS sign: "Municipal Court Criminal Division." MSs pressmen taking still photographs, flashbulbs snapping. MS unidentified man getting out of car outside courthouse, posing for press (lackluster image quality makes it hard to ID). MS UMWA President John L. Lewis getting out of car outside courthouse, walking slowly, deliberately with cane in hand. 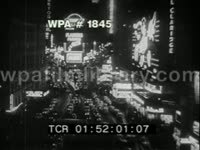 Nice Ms several newsreel cameramen with short reel cameras filming, panning left. CU John L. Lewis wearing fedora, looking grim, somber. MS press corps outside courthouse. Coal Strike Threatens US Economy MS UMWA (United Mine Workers of America) President JOHN L. LEWIS posing with Secretary of the Interior JULIUS KRUG. MCU John L. Lewis. 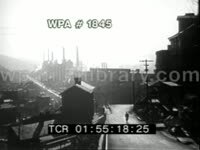 H/a LS mining town; TLS coal miners leaving mine. LSs coal mine. CU posted UMWA notice. MS/CUs women stuffing envelopes with government notice to mine workers. MS John L. Lewis leaving building wearing fedora & overcoat. Coal Strike Over - New Contact Ends Nine-Month Walkout. Coal Strike Over. New Contact Ends Nine-Month Walkout The United Mine Workers of America which was formed in 1890 ends a nine month walkout strike. 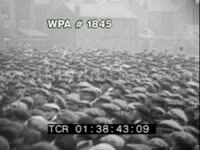 The miners petitioned for; Death Benefits, Health & Welfare and Wage Agreements. Good news for the U.S. is the ending of the serious coal strike. John L. Lewis and the mine operators sign a new contract in Washington that sends the miners back to the pits after a nine-month crisis that threatened our national economy. MS of the union leaders, John L. Lewis signing new contracts ending the nine month walk- out for the miners. MS of coal miners going back to work. CU shots of two smiling miners. MS of the trains that take the miners down into the mineshafts. CU shot of coal coming out of the mine. Last shot MS of trains in a train yard smoke coming out of the trains. MSs United Mine Workers of America (UMWA) labor union President John L. Lewis seated at table laden with microphones, delivering fiery speech at Senate Committee hearing on mine workers conditions "If we must grind up human flesh and bones in the industrial machine called modern America, then before God I assert that those who consume the coal and you and I who benefit from that service because we live in comfort, we owe protection to those men first. And we owe security to their family if they die. I say it. I voice it. I proclaim it. And I care not who in Heaven or Hell oppose it. That's what I believe about that." John L. Lewis speaking. Labor leader John L Lewis standing outside building, wearing dark suit and coat, cigar between fingers of left hand, flanked by white men dressed in crisp business suits and fedora hats. Traveling shots John L. Lewis and entourage walking toward building. Coal Mining: Low angle TLS looking up at coal mining equipment. MS coal miners working in mine. LS/MS's injured or dead miners on stretchers, being taken out of disaster areas, through crowds (mine mishaps, explosions, cave-ins, etc). MS handwritten sign reading "BULLETIN-Monday has been proclaimed as Memorial day for miners lost in No.5 explosion...Will be closed all day. GV pan of men and women standing behind closed iron gate. MS's JOHN L. LEWIS (head of the mine worker's union) talking with reporters, walking into building for negotiations. GVs miners exiting mine on rail cart (lunch break or end of shift). LS miners walking w/lunch boxes. GV stationary coal carts. GVs abandoned coal mining facilities. 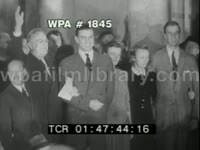 DO NOT USE TRUMAN AUDIO (Courthouse Imagery is Fine): CU building exterior reading "Municipal Court Criminal Division" MS John L. Lewis (head of the mine worker's union) in court. MS John Lewis exiting courthouse. Panning labor union leaders including American Federation of Labor (AFL) President Samuel Gompers (far left), and United Mine Workers (UMWA) President John L Lewis (second from right) posing for cameras outside the White House. Elderly Samuel Gompers talking. MS Samuel Gompers shaking hands with John L. Lewis. John L Lewis standing outside building, talking. Sign above door: "United Mine Workers of America." TLS UMWA labor union leader John L Lewis and aides standing together outside office, posing for cameras. MS John L. Lewis speaking to group of white men. 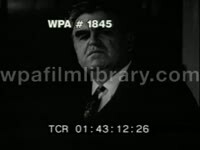 John L. Lewis turns to camera. Sign over marquee: "Mass Meeting, Hear John L. Lewis, President of Congress of Industrial Organizations, Bishop Sheil, Alderman W.A. Rowan, Van A. Bittner, Coliseum, Sunday July 16th at 8pm." 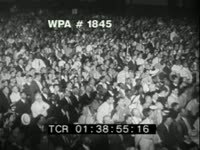 Panning high angle LS large crowd seating at indoor rally - note both Caucasian and African American workers are represented. CIO President John L Lewis speaking "The workers of this country want representation. They want organization. They want participation. They want protection. They want employment. 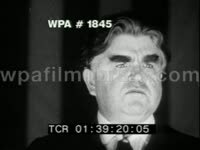 And they're going to have those things through the leadership and the instrumentality of this new labor movement "
Congress of Industrial Organizations (CIO) President John L Lewis seated at desk during press conference. 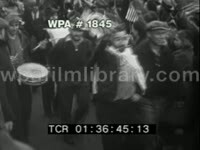 Striking mine workers picketing on sidewalk, some holding U.S. flags; scab labor walks through picket line, unmolested; LS striking laborers waving sticks, one man holding sign that reads, "Don't Scab on your Fellow Workers." John L. Lewis conducting conference meeting. CU John L Lewis chomping on cigar. MSs John L. Lewis seated at desk, reading statement. 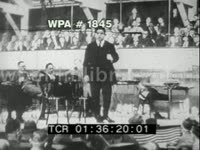 John L. Lewis standing before several microphones. Governor of Michigan Frank Murphy. Gov Frank Murphy seated at desk. John L. Lewis sitting in office with Gov Frank Murphy and GM representative. 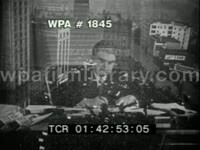 Frank Murphy watching as Mr. Lewis shakes hands with GM rep.
Congress of Industrial Organizations (CIO) President John L Lewis working at desk, writing. 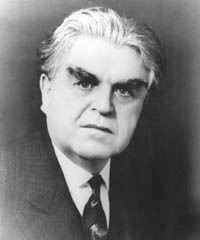 John L. Lewis looking confidently into camera. John L. Lewis standing during CIO convention, receiving accolades. Jubilant white men at convention. John L. Lewis speaking "You ought to know that the CIO is merely a dictatorship, and the chairman of it set himself up in office without your will and contrary to your desire. Surely this is an unseemly action on your part. Don t you know that you're applauding a dictator? You know, it's a sheer waste in another way. 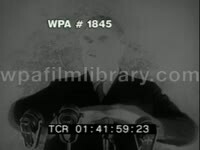 You've actually wasted more energy in this convention this afternoon, bouncing around the convention, than the American Federation of Labor expended in 57 years." TLSs conventioneers standing, applauding, laughing, cheering. South Lawn, portico of the White House in Washington DC. 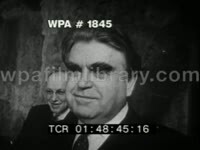 Congress of Industrial Organizations (CIO) President John L Lewis arriving at the White House, posing for newsreel and still cameramen. John L. Lewis angling fedora hat, posing for pictures outside White House. John L. Lewis being interviewed by reporters outside White House. Excellent MS press photographers taking pictures, flashbulbs snapping (press corps, paparazzi, media). John Lewis entering White House. John Lewis and aides exiting office, the CIO President looking grim & wooden. John Lewis stalking hallway, exiting building, fedora hat slouched over eyes. 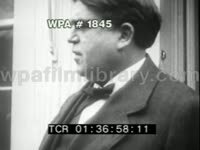 John L. Lewis, "President Roosevelt will not be re-elected for the third term unless he has the overwhelming support of the men and women of labor. If he is, therefore, re-elected, I will accept the result as being the equivalent of a vote of no-confidence, and will retire as the President of the Congress of Industrial Organization at its convention in November." LSs Congress of Industrial Organization (CIO) convention, November 1940. 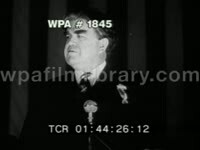 CU John L. Lewis speaking to crowd: "And I say to you that whomever you elect as my successor, give to him your unwavering loyal support because without that support his efforts will be as nothing." Conventioneers offering standing ovation. MS John L. Lewis passing honorary gavel & CIO stewardship to former UMWA Vice-President Phillip Murray. John L Lewis & Phillip Murray shaking hands. Clothing Workers President Sidney Hillman standing in background. John L. Lewis smiling, smoking cigar. MS United Mine Workers of America President John L Lewis walking hallway with UMWA leader Thomas Kennedy and unidentified woman. Glass door "UMWA, John L. Lewis, President". 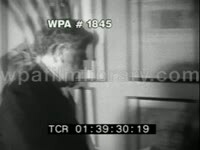 Man opening door and entering office, camera in tow. John L Lewis seated in office. 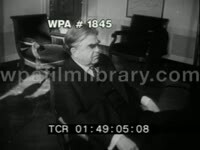 Kathryn Lewis (Catherine Lewis) talking with her father, John L. Lewis. 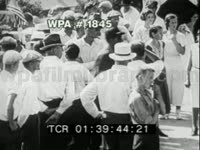 Panning MS UMWA President John L. Lewis walking through crowd, reporters, newsreel cameramen. MS John L. Lewis posing, scowling outside building. Panning MS United Mine Workers of America (UMWA) President John L. Lewis passing press photographers, reporters, newsreel cameramen gathered outside municipal court building, entering courthouse. 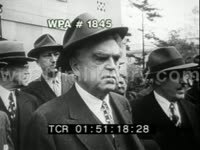 John L. Lewis, UMWA aides (Thomas Kennedy, perhaps among them), Rear Admiral Joel T. Boone, and Secretary of the Interior Julius Krug exiting building following UMWA Welfare Fund agreement between state and labor, posing for press photographers and newsreel cameras. 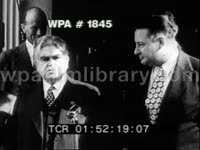 John L. Lewis and Julius Krug shaking hands, Secretary Krug saying, "I'm sure that you'll agree with me, Mr. Lewis, that it's a contract as fair to the operators as to the men alike. Too bad we didn't have it two months ago." 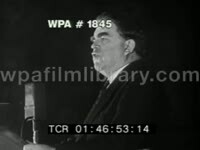 Biography of U.S. labor leader John L. Lewis. LS crowded room during Senate Committee hearing. Grim-faced United Mine Workers of America (UMWA) President John L. Lewis seated at Senate Committee hearing, "In the first year of the recent World War, in a full 12 month period in which the United States was engaged after the declaration of war by the Congress, the casualties in the coal mining industry exceeded the casualties of all our armed forces on any sea or in any land. Yet we can't get the mining laws enforced. We can't induce the several states to enforce their own mining laws. And we can't induce the government of the United States to carry out its own contracts and its own promises, henceforth, its own safety rules and regulations. (Lewis bangs table) The Director of the Bureau of Mines said there were two mines only that didn't violate the code. Now on this particular day of Our Lord, Mr. (Julius) Krug has found 518 mines that he shuts down because they're unsafe. May God in Heaven forgive him for not finding those out before him taking action long delayed before these men died. (Senate Committee panel listening somberly.) He just permitted them to die by negligence and inaction and by dishonorable violation of his own agreement made with the United Mine Workers of America. His promise given to the coal miners and to the American people, that's all he's done. And in so doing, I think he's dishonored his office. And I think he's brutalized the mine workers. And I think he's brought confusion and bitterness and economic loss to the American people." CU United Mine Workers of America (UMWA) President John L. Lewis standing, speaking at meeting, Thomas Kennedy seated to his right, smoking cigar. 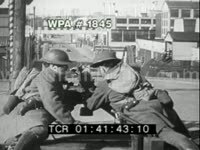 Slow motion MSs John L. Lewis posing for newsreel cameramen outside Statler Pharmacy. Panning MS John L. Lewis walking along sidewalk, passing camera.